I have been watching the world grow more and more cruel. It’s not position I’d ever choose willingly, nor is it one that I occupy without actively opposing its growing strength. Nonetheless, this world we live in has brought me to it. I can’t speak for others but I can tell you that, to me, the current state of the world is terrifying. Rather than being united against the overpowering darkness, we fight amongst ourselves… teach children to scream obscenities they don’t even understand… shed blood without bothering to realize that it’s all the same color when it’s spilling onto the ground… and there’s no end in sight. It’s understandably disturbing to students of history: those that have studied the recurring patterns and the turbulent decades that follow. It is just as disturbing, though, to those whose visions reach into the far future. Seeing the current state of the world, I see the groundwork being laid for the dark futures some of us create. 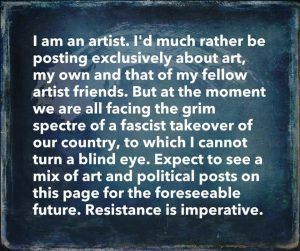 The toxic wastelands, unwarranted division of peoples, unchecked abuse by those who have managed to seize power… those nightmares crafted in the minds of the creative collective seem to be looming on the horizon. I hope I’m over-reacting… but it is a little hard to tell. The DayJob continues its quest to liquefy my brain. Cheer season is in full swing and the youngest spawn has a full schedule until sometime in November (at least). Consequently, so do said spawn’s parental units. We are back to triple-digit highs (37.7c and above, for those whose brains are metric) with thick clouds and random sprinkles. And, just to make life interesting, I’m still writing and crafting as if none of the above items in this list have any bearing on anything.